Forming connections with your clients’ heirs is one of the best ways to begin managing client relationships for longevity. 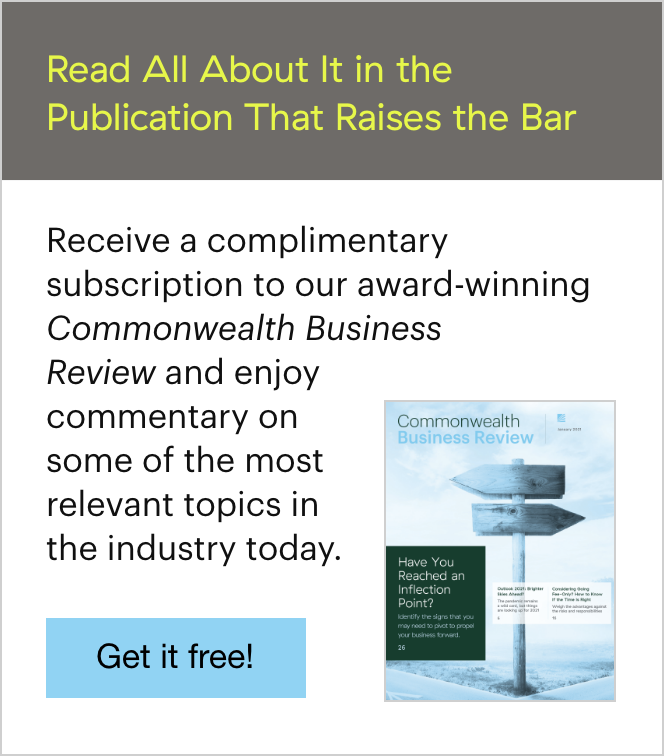 According to Vanguard research, “during the next 15 years, as much as $24 trillion could be passed from baby boomers and their Silent Generation parents to their 141 million Generation X and millennial children and grandchildren.” How will you leverage this opportunity to retain assets across generations? 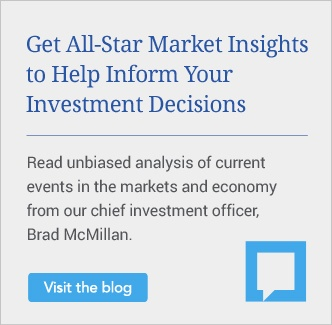 While most advisors try to build and maintain connections with their clients’ spouses and children, not all of them are proactive in managing client relationships for longevity. Take a look at your practice, and see how many of your clients are at least age 55—40 percent? 60 percent? 80 percent? What will happen to your revenue stream as clients start to pass away? Shockingly, Vanguard also has found that “70 percent of widows leave their husband’s financial advisor within a year of the husband’s death.” Further, more than 95 percent of heirs switch advisors after both of their parents have passed away. So unless you really enjoy prospecting and the thrill of looking for new clients, you should be formulating a plan to retain assets across generations now. The children of your long-term clients probably know that college tuition, home down payments, and other things might have been possible because Mom and Dad worked with you. You couldn’t ask for a better warm lead! And if your newer clients like and respect you, there’s a strong likelihood that they’ve talked about you in a favorable light. 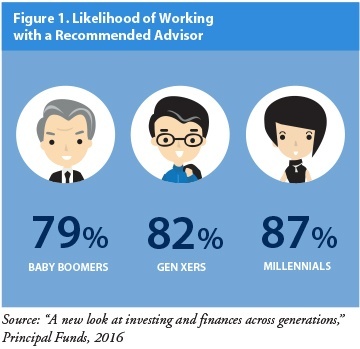 According to recent Principal Funds research, individuals are highly likely to work with a financial advisor who comes recommended by family, and the likelihood increases with younger generations (see Figure 1). 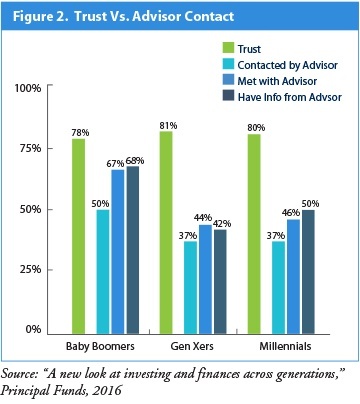 In addition, Principal Funds found that, “across generations, there is already an elevated level of trust between investors and their family’s financial advisor. This includes a strong propensity to work with their family’s advisor.” This is true regardless of whether these investors have had much contact with the advisor (see Figure 2). So the good news is that if your clients’ children already know you, they are highly likely to work with you. And if they don’t already have contact or communication with you, they are still predisposed in your favor! The trust factor carries into the next generation. Holding onto clients across generations helps maximize your firm’s future value, as the age distribution in a book of business is an important factor when discussing valuation for a practice. From a prospective buyer’s point of view, why should he or she pay top dollar for a practice that’s heavily weighted toward aging seniors? Most of the value from those long-term clients has already been received—by the selling advisor. In fact, if an advisor is going to buy a practice, he or she counts on a certain percentage of clients and assets remaining in place to make the purchase worthwhile. With a predominantly senior clientele, you might also need to factor mortality aspects into your retention ratios. Compare that with a book that includes a healthy proportion of good clients in the 35–55 age range. For which would you be willing to pay more? So, what can you do to retain assets across generations and position your practice for success? 1) Know the spouse well. Start involving clients’ spouses, women especially, in meetings and social gatherings now. Women tend to live longer than men, and if you don’t have a good relationship with the woman who inherits, you could lose the assets. Hold a birthday party for your top clients, and invite their children to attend. It’s an easy way to get to know everyone socially, without a pressured atmosphere. Ask clients if their out-of-state kids will be home for holidays or vacations, and make it a point to meet them. Whether it’s a New Year’s brunch or a backyard barbecue, building relationships with heirs is a smart move. 3) Understand what next-gen clients want and need from you. Although there are stereotypes about millennials not having money to invest or not managing their money well, a recent Charles Schwab survey found the opposite to be true. In fact, millennials ranked higher than other generations in three of four categories in the Modern Wealth Index, which seeks to track how Americans are “planning, managing, and engaging with their wealth.” Whether your conversations with younger generations are about caring for older relatives or buying a home, your position of trust within the family allows you to have impact. 4) Be aware of communication preferences. Next-gen clients might not want a face-to-face meeting, but they may be open to FaceTime or Skype. Assume they’re checking you out on Facebook and LinkedIn, and follow them on Twitter if they’re on it. 5) Leverage social media. Younger generations go to social media for both information and relationships. Read and post to LinkedIn, Facebook, Twitter, and other social media sites, and leverage technology. If you have a company video, post it to channels other than your website where your target audience might look for it, such as YouTube or Vimeo, or even create a podcast. Managing client relationships for longevity is a crucial part of positioning your practice for success, not just today, but for years to come. You can strengthen existing relationships and cultivate new ones by simply getting to know your clients’ family members and heirs and adding them to your newsletters and social media feeds. And it’s a heck of a lot easier than cloning, too! What are your strategies for managing client relationships for longevity? 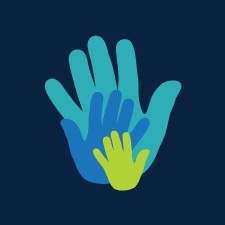 How do you build connections with your clients’ children to retain assets across generations? Please share your thoughts with us below!